Other: You need to book a reservation through Urbanspoon– book weeks in advance if you want popular times! It says something about a restaurant when you have to make reservations over a month in advance to get a 7pm seating!! We found Playa Cabana to be upbeat, relaxed, and welcoming, with delicious, fresh food (everything is made from scratch and local ingredients when possible) and a great selection of margaritas! We were seated out on the back patio, which in winter time is covered and heated to a comfortable temperature. The restaurant was packed– no chance of getting in early for our 9:30pm Wednesday reservation! With the approval of our lovely server, my dining companion and I ordered three dishes. We started with the ceviche of the day- fresh Swordfish with peppers, onion, and cucumbers marinated with lime and chili. Sadly, I cannot eat peppers, cucumbers, or onions but my dining companion had no problem eating all of it herself! I did nibble on the homemade chips, however- which were crunchy and salted perfectly. We moved onto the crab bucket (cubeta de cangrejo), which was 6 whole crabs steamed in a delicious chipotle butter. This was certainly an effortful and messy dish (you have to crack the crab using a special tool and then dig out the meat), but the work made it taste even sweeter! Our server was absolutely fantastic, bringing us extra paper napkins and bowls of lime water to freshen up after we were done. 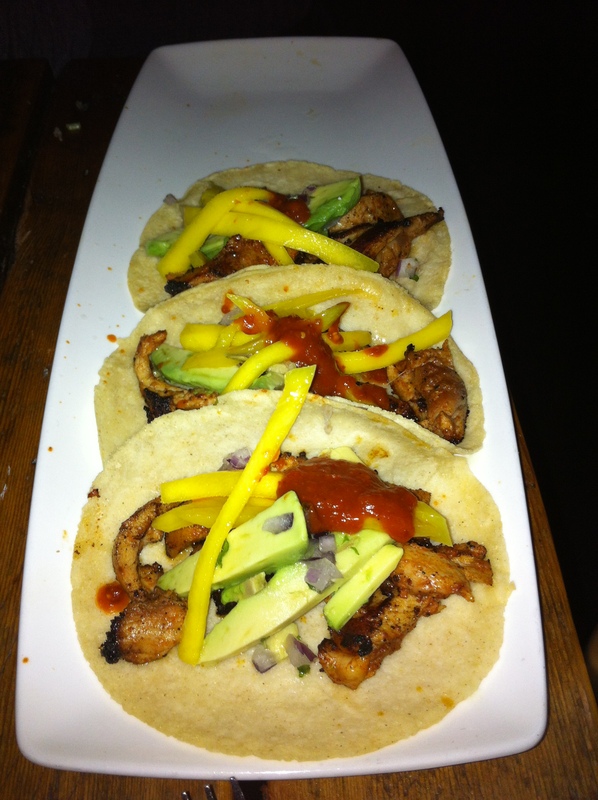 We finished off with chicken tacos (tacos de pollo el carbon). These were three tacos with fresh soft corn shells, guajillo-chipotle marinated chicken, sliced avocados, red onions, mangos, and a medium-spicy sauce. They tasted fresh and fantastic. This entry was posted in Mexican, Recommended, Seafood, Uncategorized and tagged burritos, enchiladas, flautas, guacamole, margaritas, tacos, tostadas. Bookmark the permalink.